Diva Devotee: [Discuss] Drake Uses Deceased Muse, Aaliyah, on New Song "Enough Said"
[Discuss] Drake Uses Deceased Muse, Aaliyah, on New Song "Enough Said"
Rapper Drake has made no bones about his adulation for deceased singer, Aaliyah. 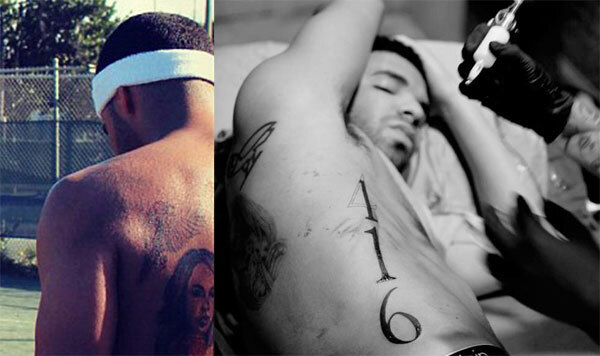 He even recently had a second tattoo dedicated to her- his first being a picture of her face on his back (! )- down the side of his torso. Being such a prominent source of inspiration on his own career, it's little wonder that he would eventually create a song that featured Aaliyah. I just imagined that when that day came it would involve sampling material that was already out there! Instead, Drake has managed to get his hands on some unheard, unreleased material and created the "duet" Enough Said using it. Its been over a decade since the star died in a tragic plane crash, and since then her family, as well friend and producer Timbaland, have resisted releasing further material (which apparently there is plenty of) by Aaliyah. This being the case, it's odd that someone unconnected to the family (i.e Drake) has taken it on himself to do so. I know they trying to drop some Aaliyah records, but if [Drake] do it, it should be with me and him, and Missy. I don’t know what’s going on. For it to be on his record, that would not be right. About Enough Said, itself? Well I can't deny it's good to hear Aaliyah's velvety voice on something new- her lower range was sounding strong on this recording- but the release isn't a revelation, or even comparable to the material already out there by the the alternative Rnb Diva. I loved hearing Aaliyah's lows and voice overall again, even though it seems so unnatural to be hearing her again. Not going to lie, I find this all a bit creepy. I agree with yourself and Serendipity its lovely to hear her sensual tones again! My opinion is while her contribution here is solid and a treat for the ear its totally detached from Drake's, his part and hers seem very disconnected lyrically speaking. As for her appearance, I would much prefer to listen to her back catalogue. There is always a big risk in bringing a deceased artist into your work as you stand the chance of making them look awful and dumping on their legacy, that is not the case here, her talent speaks for itself but its a risk not worth taking as far as I am concerned. What is worse is that this trend of 'bringing back the dead' is getting infectious, not that I will ever be watching the shi...oops I meant X-Factor I read a crazy (probably false) article about them having holograms of deceased artists such as Elvis, Jacko ect for contestants to "duet" with....disrespectful to say the least! However I do think this is a lovely chilled little number anyway! I felt the same until I saw this comment on a video where it stated that Aaliyah is asking what is wrong with Drake? What's on his mind? and he responds with what's plaguing him . But I really prefer just hearing Aaliyah, Drake kind of ruins it for me, which is odd in my case because he's one of the few rappers in existence that I can usually listen to. Yeah, I don't think Drake added anything of merit to this. I'm in agreement with the rest of the commenters here. It's nice to hear her voice again but also weird. Drake said that he will be releasing a new album of hers in the future, however, Missy and Timbaland aren't involved in the project. Her family didn't even know about it. I wish people would leave the dead alone. It's essential to have a clean skin before applying a tanner. New to the market is a Bikini Thief St Barts tankini in a two piece.